The Victoria & Albert Museum (London) held a major exhibition on Baroque art in 2009. 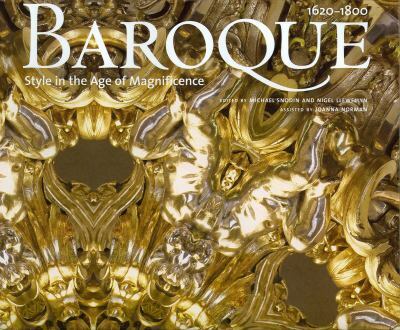 The lavishly illustrated exhibition catalogue, Baroque 1620-1800: Style In The Age Of Magnificence, was edited by Michael Snodin and Nigel Llewellyn. The catalogue is organised thematically rather than chronologically or geographically, though co-editor Snodin's chapter on The Baroque Style provides a useful overview. Snodin argues that the Baroque was "the first style to appear in both world hemispheres and all the continents except for Australasia." The catalogue takes a suitably international approach, creating a comprehensive survey of Baroque decorative arts and architecture. Baroque 1620-1800 is a companion to two earlier, equally comprehensive V&A surveys: Art Nouveau 1890-1914 (published in 2000) and Art Deco 1910-1939 (published in 2003). These three books illustrate the gradual decline of decoration, from the unrestrained ornamentation of the Baroque to the modern, decorative Art Nouveau and the streamlined Art Deco.